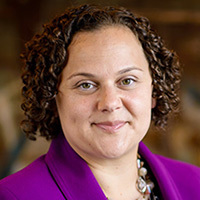 Trista Harris is a philanthropic futurist and nationally known as a passionate advocate for new leaders in the philanthropic and nonprofit sectors. Trista’s work has been covered by the Chronicle of Philanthropy, CNN, the New York Times, and numerous social sector blogs. She is also the co-author of the book “How to Become a Nonprofit Rockstar” and speaks internationally about using the tools of futurism in the social sector. In her professional life, Trista is president of the Minnesota Council on Foundations, a vibrant community of grantmakers who award almost $1 billion annually. She has received numerous awards including the Association of Black Foundation Executives' Emerging Leader Award, the Humphrey School of Public Affairs Public Leadership Award for Social Justice and Inclusion, was on the Chronicle of Philanthropy's first-ever 40 under 40 list, and is a 2015 Bush Fellow.